German science ministry demands environmental assessment before nutrient dumping can begin. The German science ministry has suspended a planned Indo–German ocean fertilization experiment in the Southern Ocean, and asked the German research institute behind it to commission an independent assessment of the study’s environmental safety. 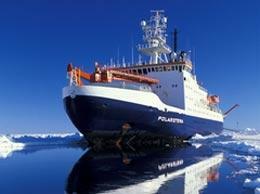 A 48-strong international team on board the Polarstern, an icebreaker operated by the Alfred Wegener Institute for Polar and Marine Research (AWI), will reach its destination in the Scotia Sea by the end of this week. The scientists had planned to dump their cargo of 20 tonnes of iron sulphate over a 300-square-kilometre study area to induce an algal bloom. Stimulating algal growth with extra nutrients is believed to be one possible way of sequestering carbon dioxide from the air. But environmental groups claim that the experiment, called LOHAFEX, would violate a moratorium on ocean fertilization that Germany brokered last May (see ‘Ocean fertilization experiment draws fire‘). The technique is controversial because its likely effects on marine ecosystems are uncertain. Studying these effects is the main rationale for LOHAFEX, the sixth iron-fertilization experiment in the Southern Ocean since 1993. Karin Lochte, director of the AWI, told Nature last week that the German environment ministry, which has now asked the science ministry to take action, had not raised any objections when it was initially informed about the plans last year. The AWI insists that the experiment is completely harmless to the environment, and fully in line with the United Nations Convention on Biological Diversity. The institute plans to provide an independent environmental assessment of the experiment within the next ten days, and hopes that the science ministry will then give the go-ahead for fertilization to begin.